On this date in 1862, the Mexicans defeated an invading French army at the Battle of Puebla. This might not sound like much, these are the French we’re talking about, but in fact, the French had the best army in the world at that time. 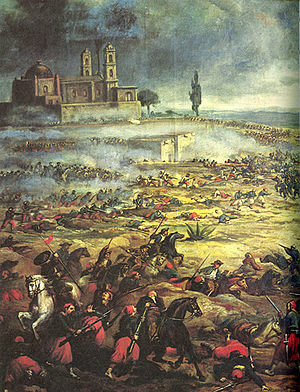 The Mexican forces were outnumbered two to one and out gunned, yet they managed to rout the French. So, the Mexicans have been celebrating the fifth of May, or Cinco de Mayo, ever since. This holiday has spread here in the United States in recent years. At first, I objected to celebrating a “foreign” holiday, but then I reconsidered. We celebrate St. Patrick’s day for the Irish, Mardi Gras for the French and others, Columbus Day for the Italians, etc, so why not Cinco de Mayo for the Mexican-Americans. Besides, any holiday that celebrates the French getting their butts kicked is worth keeping. I have been having fun with the e-mails that I have been receiving from the Democrats for quite a long time now, but fairness demands that I also have some fun with the e-mails that conservative groups send me, at least when they descend into silliness or apocalyptic paranoia. Such is the case with this one I got from Townhall.com. The America you know and love could look completely different in a matter of weeks. Under a plan circulating the D.C. corridor right now, up to 16 states are at risk to be terminated due to epic fiscal mismanagement. These states would simply be wiped from existence and merged into their neighbors. We’ve even seen the redrawn map of the U.S. and it’s nothing less than terrifying. California may be forced to become a part of Mexico without any state strong enough to absorb it! Last week Treasury Secretary Jack Lew even took the time to urge congressional leaders to take action before events unfold that could lead to this national tragedy. To see the redrawn map of the U.S. and learn if your state is targeted for potential termination, it’s essential that you watch this short video we’ve produced. It could be the slight head start that saves your entire future. View it here, for free, right now. This is an advertisement for Wall Street Daily, some sort of financial newsletter that seems to cater to survivalists and doomsday preppers. The link leads to a video of a fake news report of the federal government defaulting on its debts. I didn’t have the patience to watch it all the way through so I haven’t seen the redrawn map. I think Indiana would be relatively safe since our fiscal situation is strong thanks to former governor Mitch Daniels. I hope they don’t add Kentucky or Illinois to our state. I don’t want them. I also have no objections at all to giving California back to Mexico. The nuts and the crazies have long since taken control of that state and run it into the ground. Let the Mexicans straighten them out.